Many industries have equipment that must be either sheltered from the environment or maintained at temperatures different from the environment. Outdoor turbines, generators, control systems, motor control rooms, electronic equipment, communications equipment, and farm and agricultural equipment are examples. 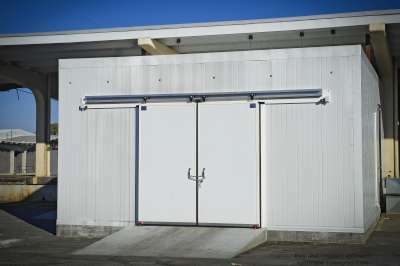 Coolstructures Inc structural insulated panels for equipment shelters and rooms yield modular buildings for rapid installation and long term secure service. Such buildings also lend themselves to control of dust, moisture, mold, and acoustic environments; and the selection of colors and surfaces can make it easier to control lighting. Coolstructures equipment shelter panels are a variant of our standard structural insulated panels so provide comparable structural and thermal attributes. Yet they are designed and manufactured with laminates and coatings that have smooth surfaces, do not collect contaminates, are resistant to mold and corrosion, and withstand frequent washdowns. Plastisol and stainless steem ate common skins over the insulation. Additionally, Coolstructures panel joining system optimizes the seams to minimize cracks where dirt or contamination can collect. Over the past 20 years, Coolstructures has developed an advanced insulated building panel system with high "R" values.